Three of the worst catastrophes in American history have taken place during George W. Bush's watch. Is this a coincidence? They are Sept. 11, the Iraq War and the devastation of New Orleans. The purpose is to shock, degrade and demoralize Americans so they will accept the loss of national sovereignty. Unbeknownst to Americans, the United States belongs to the Illuminati, a satanic secret society directing Freemasonry. Their symbol, the pyramid and "all seeing" eye, is on the U.S. one-dollar bill. So is the year 1776, which refers to May 1, their anniversary, not July 4 as people think. The symbol was put on the dollar by FDR, a 32 degree mason. Most American presidents, cabinet members and congressional leaders are Freemasons and/or members of the CFR. I appreciate that this sounds outlandish to the uninitiated. However history can be understood in terms of an all-powerful clique based in the City of London that actively seeks the degradation and enslavement of humanity through war, "revolution," sickness, starvation, depression, and now "natural" disaster. Last weekend, I commented on how an exhibit at the London Zoo encourages people to think of themselves as animals. After the hurricane, the Drudge Report referred to New Orleans' residents Sept 2 with this main headline: "Trapped Like Animals." I'm sure you noticed how the media played up comparisons between the aftermath of devastation and "a third world country." These scenes "resemble refugee camps in Somalia or Iraq," reporters kept repeating. In an emergency, speed is of the essence. As you know, help was very slow in coming. Thousands were drowning, stranded, hungry or sick. There were helicopters but remarkably few rescue boats which would have made a difference. Thus a disaster is turned into a proving ground for martial law. He continues: "My next prediction: burglaries, lootings, shootings, and/or arson incidents will happen in Houston and Atlanta. 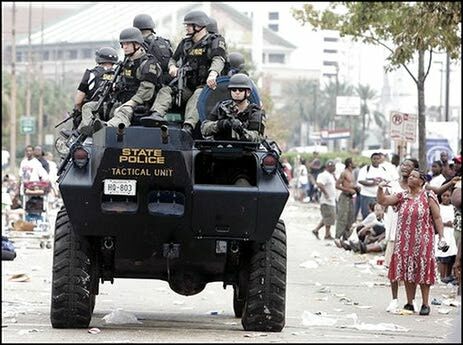 The media will attribute it to New Orleans refugees, and the "shoot to kill" order will extend to these cities police and special police, if not be accompanied by the arrival of Federal (Storm) Troops." Looting would have been limited by a strong rescue response. Americans rightly expect to be protected in times of emergency. But even some local police were seen looting or simply quit. Whether it's Iraq, (a gratuitous war America is predestined to lose,) or Sept. 11 or New Orleans, Americans are betrayed by their leaders, abandoned, humiliated and even killed. This is not an accident. It is part of a relentless process of demoralization designed to make them accept world government. Hollywood plays a part of this relentless attack on the American psyche. The scenes in New Orleans resemble those in the film "Day After Tomorrow" where the country freezes over and Americans rush the Mexican borders pleading to be allowed in. They need to destroy, degrade and demoralize us so we will accept their world government. They have to subjugate us because otherwise we will repudiate the debt, money (credit) they created out of nothing. What can we do? We must refuse to be demoralized or degraded. Let's make an extra effort to be kind and en-couraging, to treat each other like brothers and sisters.